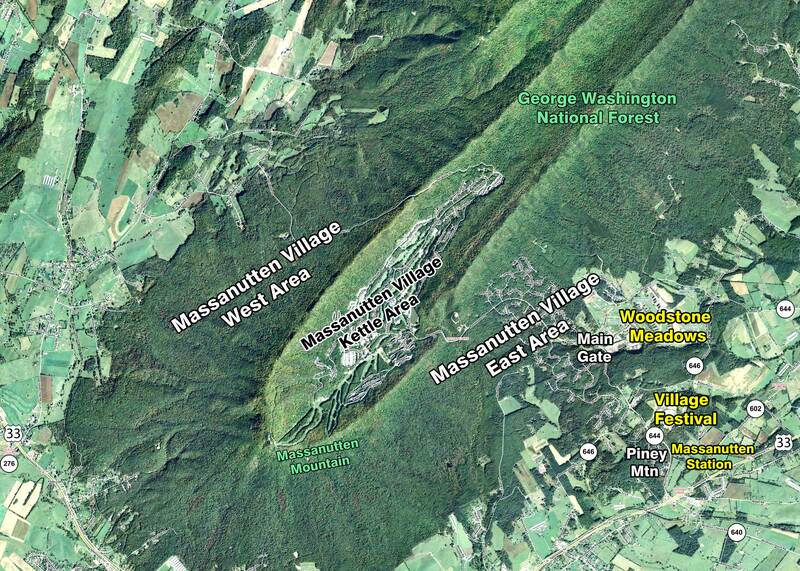 What is often referred to as «Massanutten» generally consists of a community with six (6) somewhat separate areas. Massanutten Village is a Planned Residential Community District that itself can be divided up into three distinct areas — Massanutten Village West, Massanutten Village Kettle, and Massanutten Village East (which includes the Piney Mountain single family home subdivision). 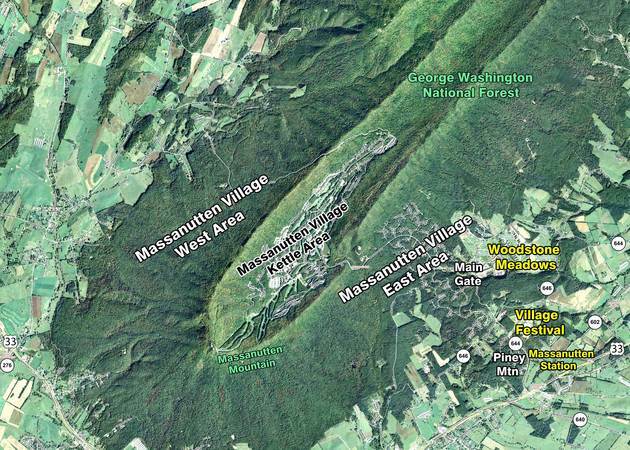 Outside of Massanutten Village and to the east, three additional areas have been planned and are under various stages of development — another Residential Planned Community District called Woodstone Meadows and two Planned Commercial Development Districts called Village Festival and Massanutten Station. These six (6) areas should be a point of departure when discussing the physical boundaries of the Massanutten community. The six (6) areas are commonly recognized by the general public. 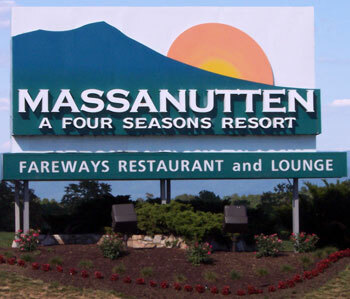 This begins with those who live in the area or have visited Massanutten seeing the sign (shown in the photo shown below) that announces the entrance into «Massanutten» at the intersection of Resort Drive and Route 33. Although the sign does not necessarily make Massanutten a community that warrants town incorporation, it certainly makes it recognizable to the general public before they become familiar with the different areas that make up the Massanutten community. From this entrance driving down Resort Drive, one sees the open space that will become Massanutten Station, the Waterpark in Village Festival, then the Recreation Center and timeshares of Woodstone Meadows, and finally the flag poles at the main gate of Massanutten Village. The six (6) areas also have historical planning with a common purpose, objective and scope as detailed in the first Section. The areas provide a common theme of housing accommodations for permanent residents and tourists along with businesses, amenities and essential services within a planned residential resort-type community. Additionally, all six (6) areas are served by a single, privately-owned water and sewerage service. The community development began over 40 years ago with Massanutten Village and the development will likely continue for at least another 40 years pursuant to existing planning approved by the Rockingham County Supervisors. The common development planning and the water and sewerage service of these six (6) areas establish logical boundaries for an incorporated town. It is important to note that the common theme of housing accommodations along with associated businesses, amenities and essential services related to these six (6) areas produces a high volume of internal vehicle traffic as people travel back and forth from residential and tourist accommodation areas to business and amenity areas. This is shown graphically in the figure below. Tourists, for example, often travel daily from their overnight accommodations in the Massanutten Village Kettle area to enjoy golfing and shopping in Woodstone Meadows, to enjoy the Waterpark in Village Festival, or to travel to points outside of Massanutten via Route 33. 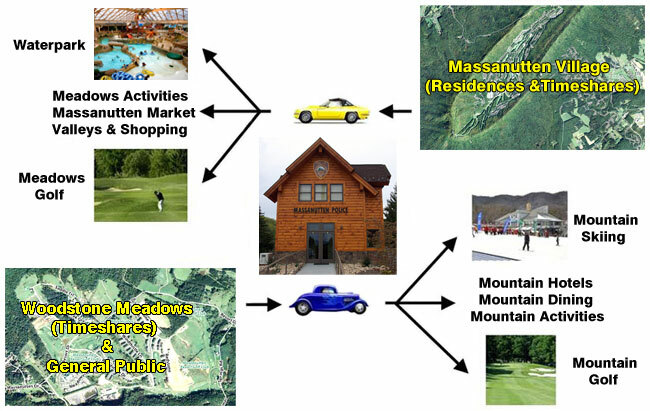 Opposing this flow, other tourists often travel daily from their overnight accommodations in Woodstone Meadows (and in the future will travel daily from their overnight accommodations in Massanutten Station) to enjoy skiing, golfing, hiking, dining, shopping, and other amenities found in the Massanutten Village Kettle area. This daily tourist traffic flow is mixed with the daily traffic flow of permanent residents who travel from their homes to points outside Massanutten for work, dining or shopping and also from their homes to the various amenities found in the community. A traffic flow of almost 5 million vehicles travels through the main gate of Massanutten Village each year. It is this traffic flow among housing areas, businesses and amenities along with sharing essential services that creates a sense of community and supports the logical boundaries for an incorporated town based on existing planning and the utility service areas. The remainder of this section of the report details the logical boundaries of an incorporated town determined by existing Rockingham County planning and by the exclusive service area for water and sewerage. The needs and costs for essential services that support establishing these boundaries will be detailed in the next four sections of the report entitled «Infrastructure», «Law Enforcement», «Parks and Recreation», and «Government» with the share of the funding burden detailed in the section of the report entitled «Budget».